Comments: Tracks 3 - 12 on Disc 2 are from the rehearsal. Performance tracks appear to be a good audience recording directly off a monitor. Rehearsal tracks appear to be a direct SB recording. 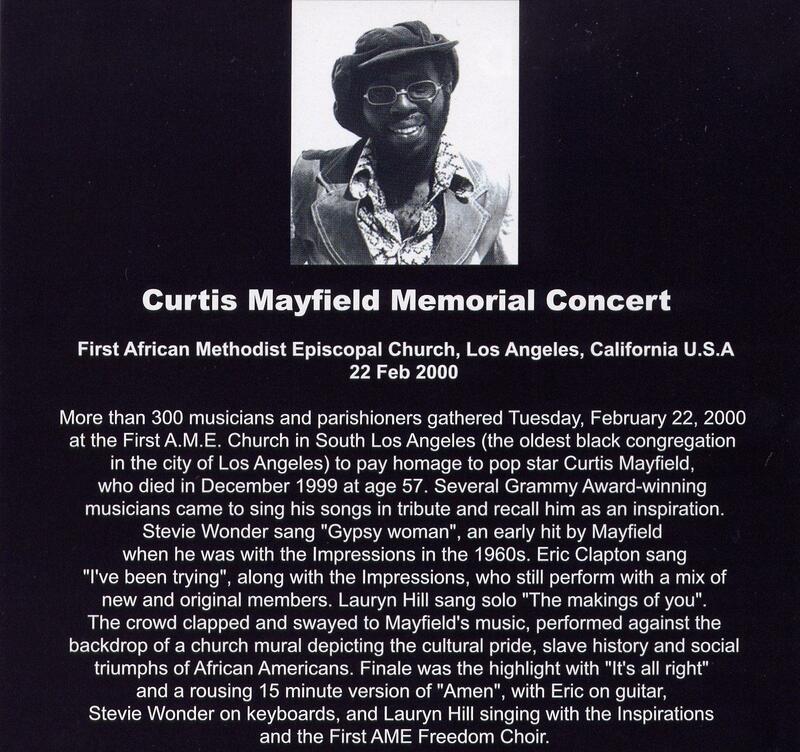 LOS ANGELES - Stevie Wonder, Eric Clapton and Lauryn Hill joined friends, family and former bandmates of Curtis Mayfield to celebrate the late soul singer's life and music at a memorial service Tuesday afternoon (Feb. 22). Wonder got the First African Methodist Episcopal Church congregation singing and dancing as he led a call-and-response session of his improvised lyrics to "It's All Right", the 1963 hit by Mayfield's R&B vocal group the Impressions. 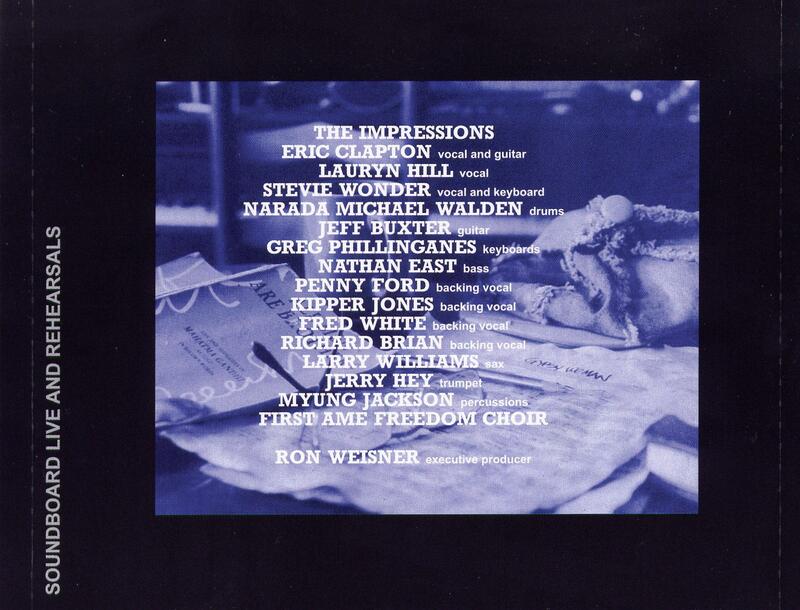 He was accompanied by Clapton on guitar, members of the Impressions, a church choir and a band. "I couldn't sleep last night, because I was so excited and nervous. This is one of the greatest privileges I've ever had." 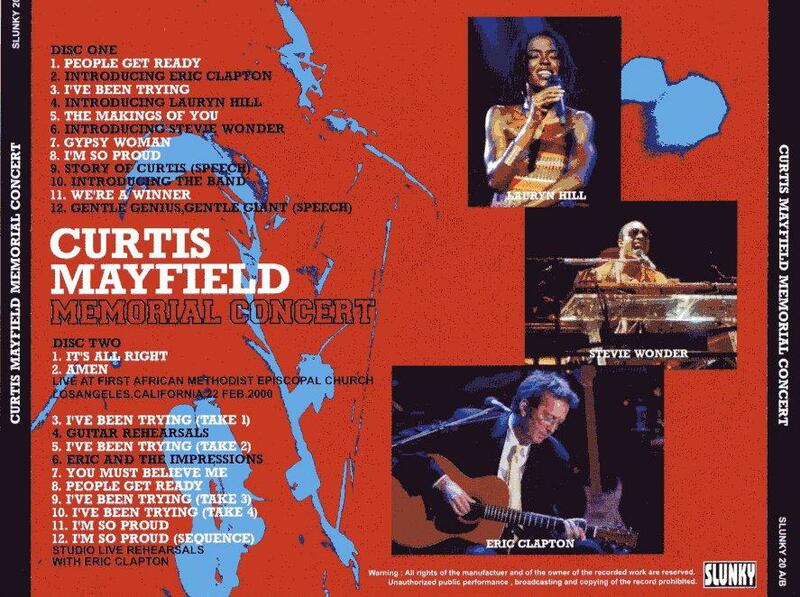 - Eric Clapton "Curtis, Curtis, Curtis will live forever," Wonder called out. "Curtis, Curtis, Curtis will live forever," they answered. During the final song, "Amen", another of Mayfield's Impressions hits, Hill got up from her 10th-row pew and spontaneously joined the group. Mayfield, whose voice and guitar brought social consciousness to 1960s soul music and helped pioneer funk in the '70s, died in December at age 57 following months of ill health related to paralysis. He was paralyzed from the neck down during a sound check in 1990, when a lighting structure fell on him and crushed his spine. Before the service began, Wonder said he was eager to pay tribute to a man he had respected since his childhood. "The first time I heard one of his records, I remember being fascinated by the style," the 49-year-old Motown singer said. "The songs were inspired." Impressions member Fred Cash said Mayfield would have loved the ceremony, which featured actor Danny Glover and Mayfield's wife, Altheida, among the speakers. "Curtis is smiling," Cash said after the service. "I know he was so happy to see Stevie and Eric and all those people celebrating him." 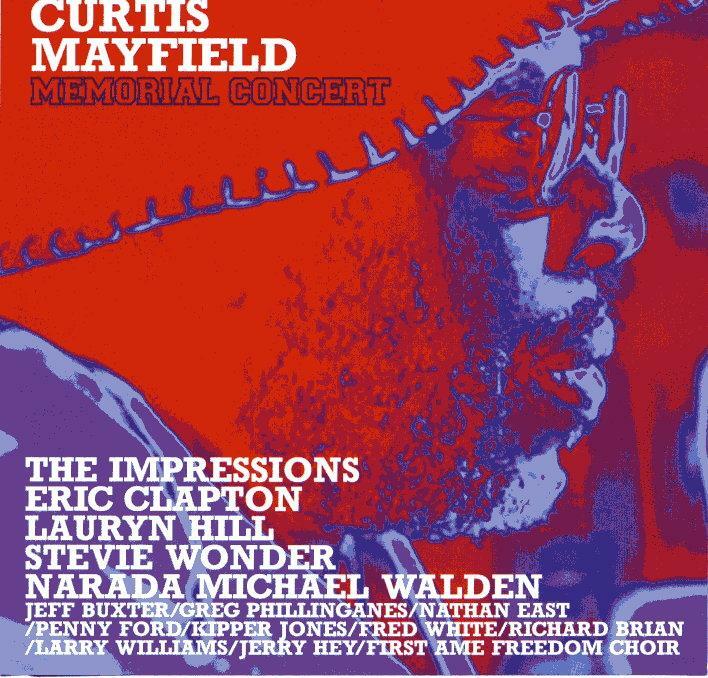 Before the finale that brought them together, Hill, Wonder, Clapton and the Impressions each led the band and choir through a Mayfield song. "I couldn't sleep last night because I was so excited and nervous," Clapton, clad in a black suit, said as he took the microphone. "This is one of the greatest privileges I've ever had." The veteran blues-rock singer/songwriter played guitar and sang on a rendition of the Impressions' "Keep On Pushing," (RealAudio excerpt) accompanied by Cash, original Impressions member Sam Gooden and latter-day members Ralph Johnson and Vandy Hampton. Hill, dressed in a light blue dress, followed Clapton with a version of Mayfield's "The Makings of You." She recalled how she found a single of the song in her mother's basement when she was a child. "This song made me feel good," Hill said. "I want to thank Curtis for the contributions he made, not only to the whole world, but to my life." As Hill sang the tune, Clapton sat in a pew swaying and tapping his feet. Wonder delivered a soulful, uplifting version of the Impressions' "Gypsy Woman," which got off to a rough start when the monitors failed to project his voice. "Can we start again?" he asked the crowd when the problem was fixed, and they responded with loud cheers. 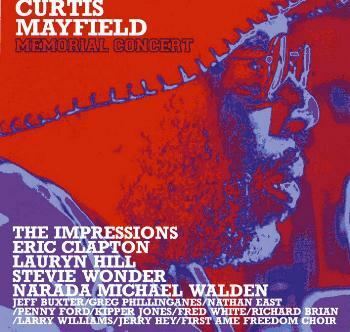 Wonder told the congregation that Mayfield's songs "reflected tremendously the heritage of we as a people, as African Americans." But today, he said, the songs suggest "that we must have a united culture around the world."